The Bev Key® is quality crafted of a durable, lightweight DIE-CAST RECYCLED ALUMINUM and finished with the finest baked-on epoxy. The companys motto; As long as theres bottles, cans and fans there will always be a Bev Key® is as strong today as it was when the motto was phrased years ago. The Twist Off function is an aid in opening the not always so easy twist off cap and the Tab Lifter is a welcomed function for the women who hate to break a nail when attempting to open a can of pop. The Pry Top function is essential today as the market share of crown capped bottle usage in the beverage industry is soaring. Wrap all these functions up in an attractive, round, lightweight and sturdy key chain that easily fits in ones pocket or purse and you can see why the Bev Key® has been one of the most useful and unique items on the market for over 18 years. 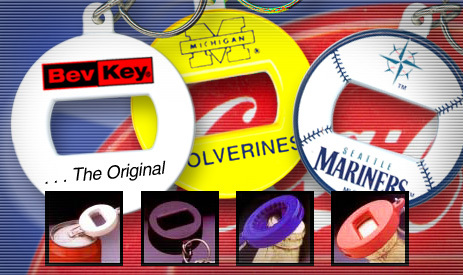 Our Retail program utilizes the most current and hottest licences available, which has allowed the Bev Key® to remain one of the top selling key chains in the market since 1983. Our Promotional/Custom program offers a product that has consumer appeal and enduring value with low minimums, quick production at a great price. This unique product has a window/pointer design with a precisely engineered fold that allows the product to hold onto the page margin by means of a gentle but firm friction fit. These features allow readers to see exactly where they left off and/or index a page for future reference. Made from durable lightweight .030 PVC plastic. Custom Imprint programs are available.